TAMPA, Fla. -- Imagine trying to identify a homicide victim based on a brand of jeans, how tall someone stood or the coins found in their pockets. The task is near impossible, and sometimes it prevents identification altogether, leaving the case cold for decades. The hope of solving more of these cold cases is why artists from across the country will be working with the FL Institute for Forensic Anthropology & Applied Science (IFAAS) at the University of South Florida Oct. 12-16. They will create facial reconstructions of nine cold case victims in conjunction with the National Center for Missing and Exploited Children (NCMEC) and the Florida Sheriff’s Association. These cases from throughout Florida consist of two juveniles and seven adults. The oldest case dates back to 1967. The artists will each be assigned a cold case victim and a 3D printed skull, which were created by Associate Professor Erin Kimmerle, USF anthropologist and director of IFAAS, and her forensics team by scanning the original skulls, and printing 3D replicas at the USF Advanced Visualization Center. The replicated plastic skulls will provide the artists information they need to sculpt the likeness of the victim. 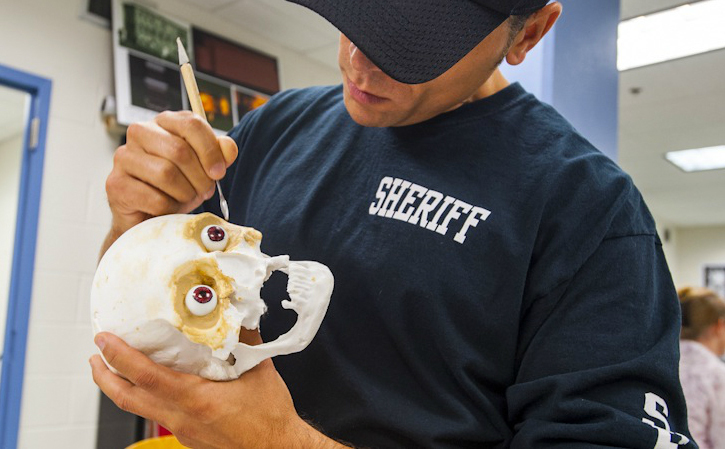 The forensic artists are trained to know the anatomy of the human face, and the bone structure will dictate the final product including the eyebrows, lip shape and eyes. The idea of pairing 3D printed skulls with a team of artists first was conceived by forensic artist Joe Mullins, who has worked for NCMEC for the past 15 years. Mullins has created countless age progression photos of missing children, as well as hundreds of skull reconstructions on his own. However, it took him eight years to get outside artists involved because medical examiners prohibited the artists from using real skulls from crime scenes. Mullins decided to incorporate 3D printing into the mix, and the first event using this technology took place in New York in January 2015. Video from this event can be found here. During the week of Oct. 12-16, forensic artists will be working in Kimmerle’s lab at USF. They will be led by Mullins as they mold and refine the clay laid over the 3D skulls. Media will be invited into the lab to record the scientifically-artistic process during the first three days. The final products will be revealed at the end of the week, along with updated information about the victim’s age, ancestry and geographic origins. In addition to creating the facial reconstructions, Kimmerle and her team will perform skeletal analysis and chemical isotope testing in an effort to help identify the victims. Several forensic scientists will also be at the workshop to share their expertise and conduct lab work on each of the cases. A model of the latest GPS mapping technology of unsolved cold case locations throughout Florida will be demonstrated. Keynote speakers for the event are Thirteenth Judicial Circuit State Attorney Mark A. Ober, and Pasco County Sheriff Chris Nocco. Additional guest speakers include Kimmerle and USF Dean for the College of Arts and Sciences Eric Eisenberg. Download a copy of the event program here. The goal of IFAAS, NCMEC and the sheriff’s offices is to identify the victims, solve the crimes and help family and friends of the victims find closure. Anyone seeing news coverage of the event who can identify the busts or provide information about these or other cold cases, please contact Crime Stoppers at 1-800-873-TIPS or submit your tip here: https://www.p3tips.com/TipForm.aspx?ID=155&P3ID=155&DSID=155 Tips given directly to Crime Stoppers that lead to an arrest are eligible for a cash reward. READ CASE 1 NOTES HERE. READ CASE 2 NOTES HERE. READ CASE 3 NOTES HERE. READ CASE 4 NOTES HERE. READ CASE 5 NOTES HERE. READ CASE 6 NOTES HERE. READ CASE 7 NOTES HERE. READ CASE 8 NOTES HERE. READ CASE 9 NOTES HERE.